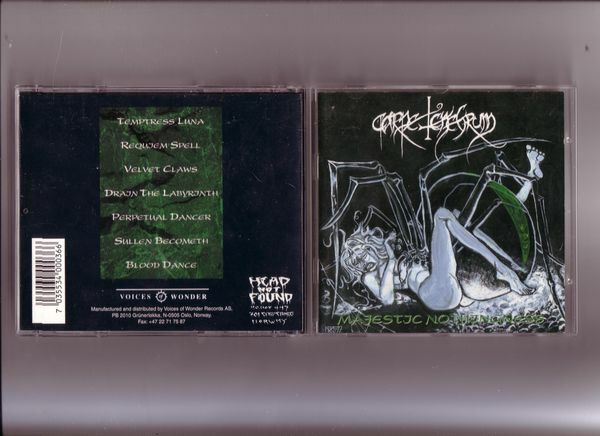 The 1997 debut album of Carpe Tenebrum on Head Not Found records. At times bordering on the symphonic styles of Dimmu Borgir (albeit earlier Dimmu, without the real symphony orchestra extravagances), 'Majestic Nothingness' certainly has a more severe, haunting edge than the majority of melodic black metal, reminding at best of 'Aspera Hiems Symfonia' era Arcturus (including the occasional clean vocals, and with an almost 'real' sounding drum machine kicking out speedy to mid-paced rhythms). There's a great deal of melody on offer which comes from the guitars rather than synth work, which makes a nice change. The guitar work is proficient, with good solos and clear cut riffage set fairly high in the mix allowing everything to be heard clearly without getting muddy. Nagash's 'black metal' vocals are fairly strong in the usual throaty hissing style, but do not really stand out as a highlight. Similarly, his clean vocals are so so, not managing to be a touch on Garm's near perfect pitch which it tries to emulate, but still, it works well enough not to grate on the ear. The synths add extra body to the riff-work, without being as in your face as say, Limbonic Art, so all in all, it works well.